Our newest product! 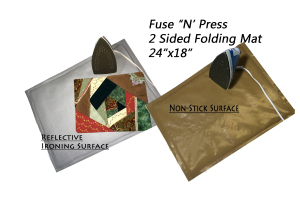 Fuse 'N' Press is a portable, fold-able, ironing mat! It has our IronSlide 2000 Ironing Board Cover on one side to Iron, and our Amazing Fiberglass sheet on the other side. Nothing can stick to the Fiberglass side, and the Ironing Board Cover is heat reflective so you can Iron in half the time! You can actually Iron on both sides of the mat. The size of the mat is 24" X 18" perfect for any project. Just place it on a table and do your projects! ** Make sure to use it on a heat safe table. Do not use on a delicate table.